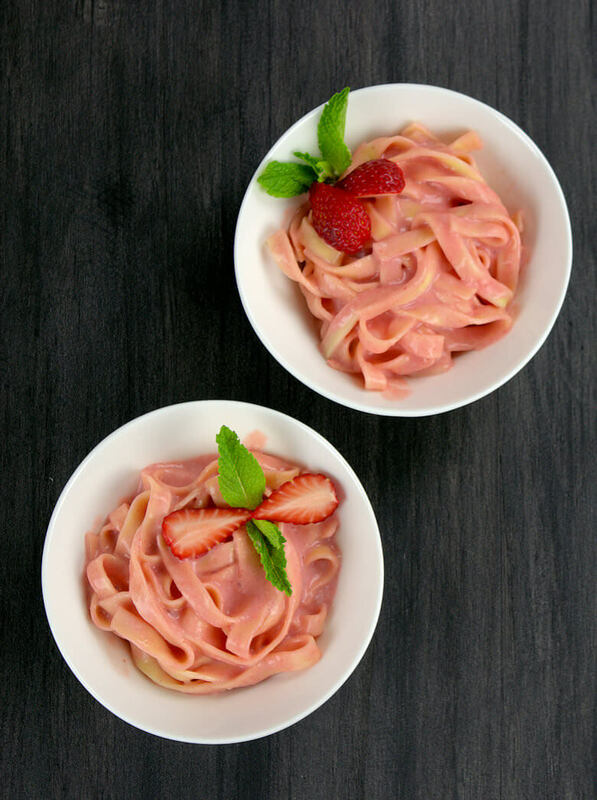 Want to bring something else to the table, try this easy, light Sweet Pasta Dessert with Strawberry Sauce. You can make it in no time, it is absolutely delicious and has a very lovely mouthfeel. The cool pasta and sauce slide down your throat with ease, reaching a happy stomach. 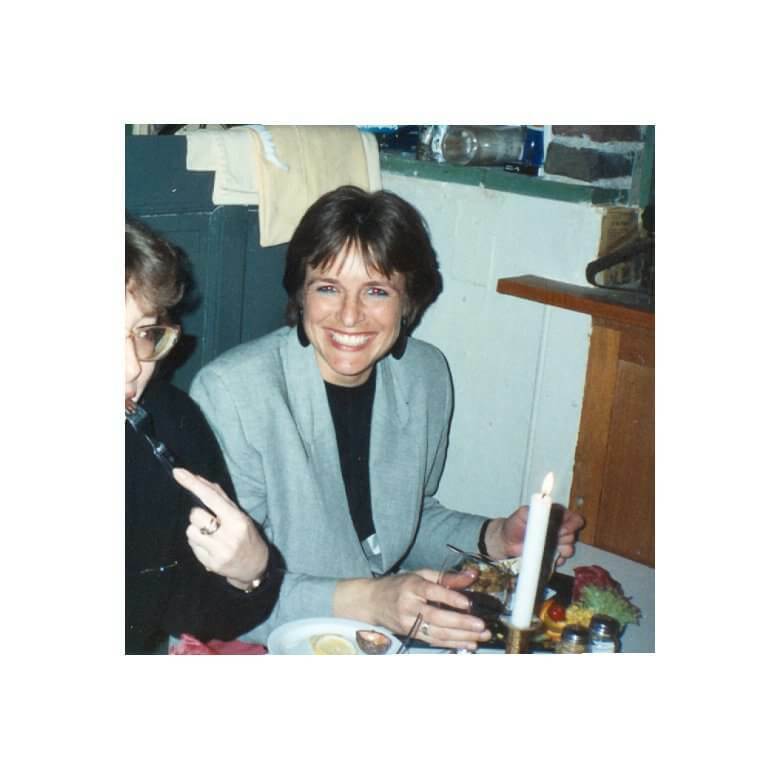 Pasta as dessert, you might think, but please humor me and try it, you will love it. Just a small bowl with lots of sauce. We eat pancakes and appetizers for dinner, pizza for breakfast, risotto for for breakfast or dessert, like my Coffee and Cream Risotto. This time, I offer Sweet Pasta Dessert with Strawberry Sauce for dessert and I know you’re gonna love it and will try other fruits as well. The fast majority of desserts are made from a carb component and a fruity part, so is this. Pasta offers the carbs and the sauce is obviously the fruit. You can make it sweeter or sugar-free if you like. Use cream, or even add a scoop of ice cream. For this recipe I used fresh tagliatelle. First of all I like fresh pasta; it is often a little softer than the cooked dry pasta. Fresh pasta is also a lot quicker to cook, a few minutes. This means that you can almost make this recipe after dinner and still be ready in time. 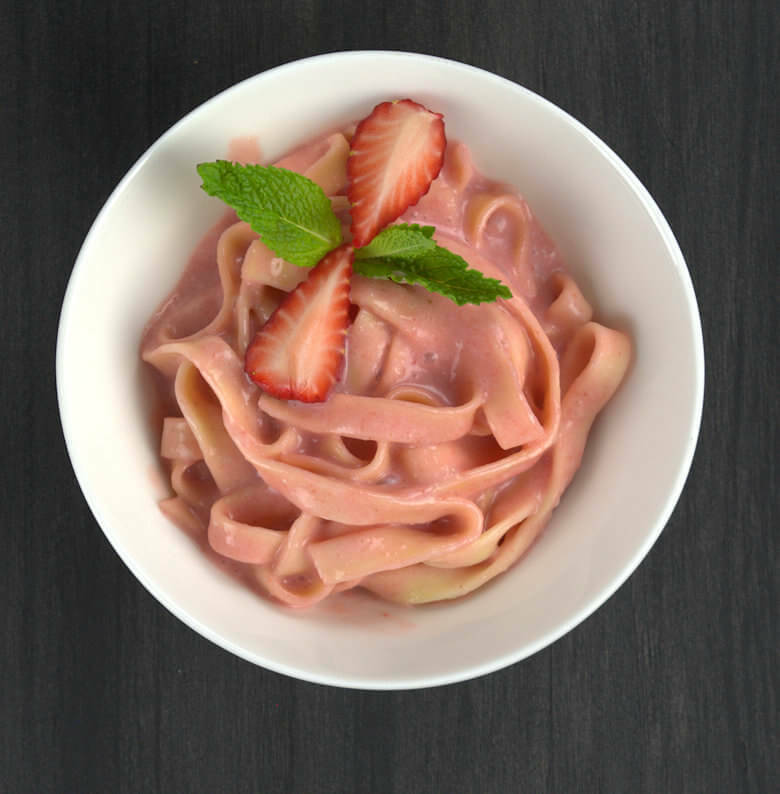 Tagliatelle, strawberries and creme fraiche are the ingredients, sweetened with some sugar. Cook and cool the pasta, puree the strawberries and combine. Can it be much easier. Are you not just a little bit curious? Try the recipe below and tell me what you think. Cook the tagliatelle and 1 teaspoon of sugar, according to the directions on the packaging. Drain and rinse in a colander until cold. Wash and clean strawberries (leave 1 behind for decoration). Cut in small pieces, transfer to food processor or use immersion blenders, add 2 tablespoons of light brown sugar and pulse until you have strawberry puree. Pour strawberry puree through a sieve to get rid of all the little seeds. Add the creme fraiche and mix well. 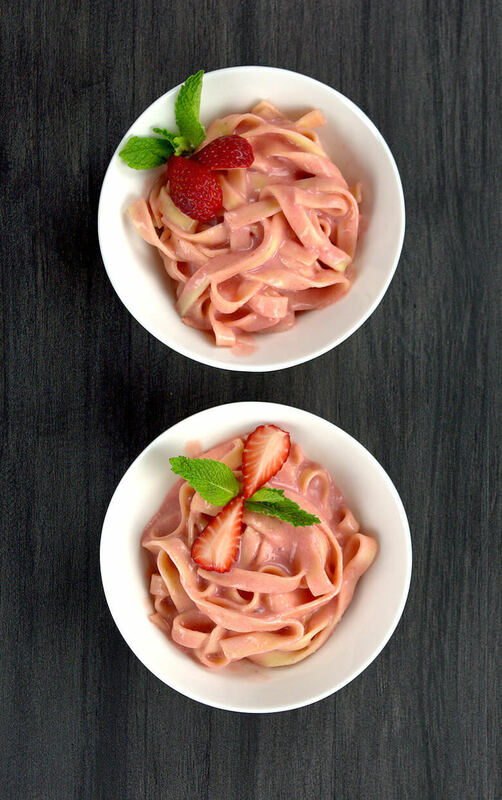 Mix strawberry sauce and pasta and divide over 2 bowls. Cut one strawberry in 4 pieces. Decorate dessert with pieces of strawberry and mint leaves.